The River Lee Hotel (formerly Jurys Cork Hotel) Cork. Hotel Accommodation in Cork, County Cork. Hotel Accommodation with a swimming pool. 4 star Hotel Accommodation in Cork, Ireland. Welcome to the River Lee Hotel (formerly Jurys Cork Hotel) Cork. A 2-minute walk from Cork's shopping area, this sleek hotel has a pool, a gym and an urban spa. There is free Wi-Fi and free parking. For more information or to check the availability of this Hotel in County Cork please click on the availability link above and below. 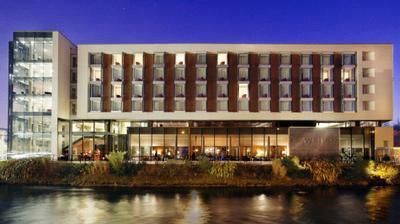 The River Lee Hotel (formerly Jurys Cork Hotel) is in Cork, Ireland. The address is Western Road, Cork County Cork.